PROUD DAY TO BE A PATRIOT Secaucus High School had four seniors sign National Letters of Intent. From left are David Son (Iona, swimming), Carlee Sanchez-Hegarty (University of Tampa, swimming), Amanda Ulrich (St. Leo University, basketball) and Jordan DeFalco (Sacred Heart, equestrian). Editor’s note: Last week was the early signing period for athletes accepting scholarships and signing National Letters of Intent with their respective schools. This is a journey around Hudson County and the respective scholarship recipients. In all the 30-plus years of covering sports in Hudson County, we never came across an equestrian to grace the sports pages. With that in mind, welcome Jordan DeFalco, a Secaucus High School senior who signed a National Letter of Intent with Sacred Heart University in Connecticut to join that school’s equestrian team. DeFalco has been riding horses since she was six years old and started taking riding lessons when she was about seven. Since those early days, DeFalco travels south to Tewksbury, where her 12-year-old horse Mardi Gras is stabled. After she began competing in show jumping events, DeFalco realized that there were some schools that offered scholarships in equestrian. Sacred Heart was one of those schools. DeFalco and her family now own Mardi Gras. DeFalco will continue to compete in shows while at Sacred Heart, studying physical therapy. 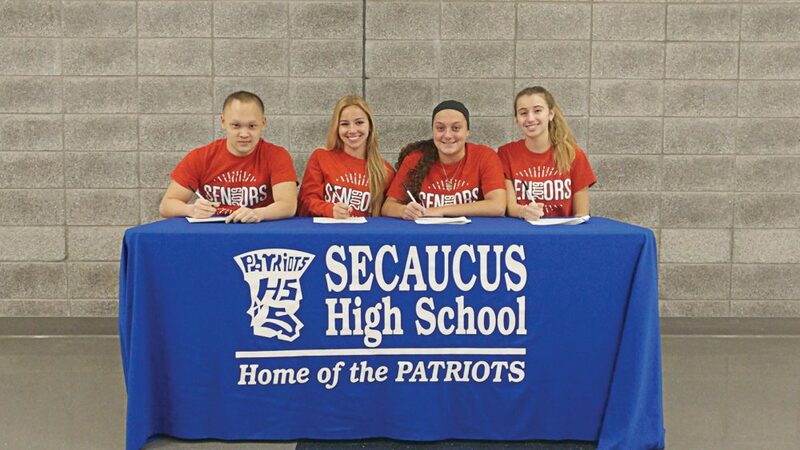 DeFalco was just one of four Secaucus athletes to sign letters last week. Basketball standout Amanda Ulrich, the two-time defending Hudson Reporter Player of the Year, signed her letter to attend St. Leo University in Pasco County, Florida. Ulrich, who will begin her senior year with an astounding 1,613 points, hoping to become Secaucus’ all-time leading scorer, knew that she was headed to St. Leo after her first visit. Ulrich doesn’t know what she wants to do past her basketball career. She might want to become a police officer or become a teacher, working with little kids. The other two letter signers from Secaucus are both swimmers, namely David Son and Carlee Sanchez-Hegarty. Son started swimming at a young age and realized he was getting better at it soon after. Son said that he started to receive letters from schools last year. Son competed in the Meet of Champions last year. Sanchez-Hegarty is headed to the University of Tampa to swim. She will be within close proximity of Ulrich. Sanchez-Hegarty will enter the University of Tampa’s pre-dental program and sports medicine. She visited 23 schools before selecting the University of Tampa. Sanchez-Hegarty is one of the more versatile swimmers around. She competes in two different butterfly events, two different individual medley events and two different breaststroke events. Sanchez-Hegarty said she was glad to share the day with her classmates. So does Secaucus. It was a proud day for all.